The soon to be retired Hubble Space Telescope (Credits: NASA). According to the space policy blog Space Policy Online, NASA will hold a workshop February 5-6 at the Marshall Spaceflight Center to discuss potential uses for the two spy satellites donated by the National Reconnaissance Office (NRO). The two telescope assemblies, that were constructed by the NRO, are leftover hardware components from a spy satellite program that was canceled in 2005. The program, which was called the Future Imagery Architecture (FIA) was an NRO program to identify, obtain, and operate the next generation photo reconnaissance satellite architecture. The FIA was intended to provide a cost-effective architecture that would provide more capable imagery satellites. The two telescope assemblies are not completed units, but rather the core optical components of the satellites. Prior to the transfer of ownership to NASA, the NRO was paying up to $100,000 per year to the manufacturer ITT Exelis in Rochester, NY to store the units. Under the terms of the agreement to transfer the assemblies, NASA would take over storage payments and would be required to fund the final construction and instrumentation of the two assemblies into working spacecraft, and it would have to fund launch and operational costs as well. The two telescope assemblies are similar in appearance and design to the Hubble Space Telescope with the difference that they were designed to look down at the surface of the Earth. 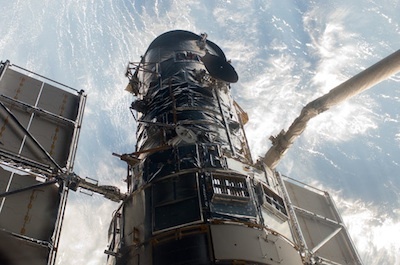 Either of the two assemblies could be considered replacements for the Hubble Space Telescope, which was serviced five times in orbit. There are no further plans to service the Hubble, which means as the telescope ages it will eventually fail. Either of the two assemblies could be used as a replacement after modifications to the optics. One other potential use for the donated assemblies is a variation of NASA’s proposed Wide Field Infrared Survey Telescope, or WFIRST. WFIRST is planned to achieve three different goals. First, it could conduct a general survey of the infrared sky and identify objects of interest that could then be examined by the James Webb Space Telescope. Second, it could be used to track the distribution of early galaxies and supernovae. Finally, WFIRST could provide an independent measure of the frequency and properties of exo-planets. The workshop might identify or at least narrow down possible uses for the two assemblies. However, even if uses for the assemblies are decided upon, current and future budget constraints will be the ultimate decider of whether or not the potential of the NRO’s gift is fully realized.